Join us on Tuesday, April 16th and the third Tuesday of every month for a free lunchtime concert at Pinellas Park Auditorium. Bring your own lunch. We provide coffee and cookies. Concert starts at 11:30 AM and ends about 1 PM. Bring friends and make new ones. Join CFTOS and learn more about the American Theatre Organ and its music. Help us maintain these magnificent musical instruments. If you enjoy crafts, we can show you how we build and maintain them. Click on the button below to join our email list, which we never share, to keep up with the latest events in the Tampa Bay area. 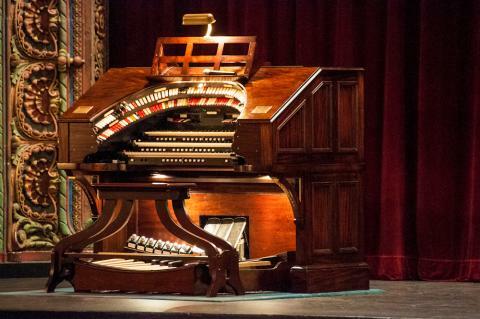 CFTOS maintains two instruments, a three-manual, fifteen rank Wurlitzer at the Tampa Theatre and a three-manual, fifteen rank Robert Morton organ at the Polk Theatre in Lakeland, Florida. In addition we are re-installing a three manual fifteen rank Wurlitzer in Pinellas Auditorium in Pinellas Park. We present free public performances on the Pinellas Park Auditorium Wurlitzer the third Tuesday of every month from 11:30 AM to 1 PM. Bring your own lunch and enjoy the music. CFTOS provides free coffee and iced tea. Join CFTOS for $25 a year and enjoy the privilege of open console on various instruments and special events year round. Click here to join our email list for concert notices.